Exotic bird breeders are animal breeders that produce and sell a wide variety of avian species including parrots, canaries, and finches. The usual duties for exotic bird breeders include cleaning and maintaining cages, preparing and distributing food, providing nesting materials, monitoring behavior, administering medications, treating minor injuries, and keeping detailed health and breeding records. Some breeders also choose to offer hand-raised young birds (which are removed from the nest and raised by the breeder). Hand-raised birds have become increasingly popular, as this rearing technique results in pet birds that are extremely well socialized for human interaction. Hand-raising involves a significant full-time commitment to feeding young birds around the clock, and this skill is best learned under the close supervision of another breeder who is experienced with the technique. Bird breeders must be familiar with the specific needs of the species that they are producing, including special nutritional requirements and nesting preferences. Knowledge of avian genetics can prove particularly useful if a breeder is seeking to produce certain prized color variations or mutations. Exotic bird breeders work closely with veterinarians to ensure that all animals used in and produced by their breeding programs are kept healthy and happy. They may also have their birds microchipped by a veterinarian for permanent identification purposes. Exotic bird breeders also may exhibit their birds at events such exotic bird shows and fairs. Attending these events is a great way to market birds to a large target audience and can also provide networking opportunities with other breeders in the business. Many exotic bird breeders specialize by producing one or just a few specific breeds. Popular species include Parakeets, Cockatiels, Lovebirds, Cockatoos, African Greys, Finches, Canaries, Amazons, and Macaws. Some breeders offer hand fed birds for sale, while others offer offspring raised solely by the parent birds. While no specific degree or training is required to begin a career as an exotic bird breeder, those with significant avian experience will be best prepared to begin a breeding program. Some exotic bird breeders have been formally trained with a background in animal science, zoology, ornithology, or veterinary medicine. Other breeders start out by raising birds as a hobby and later decide to develop the hobby into a business. No matter what the background of the aspiring bird breeder, they should be particularly familiar with avian anatomy, physiology, reproduction, genetics, nutrition, and behavior. It is also advisable to seek out an experienced mentor to consult for advice on setting up a breeding program and dealing with any problems that might arise with the birds. There are many bird breed associations, on both the national and local level, which can provide additional training and guidance on setting up bird breeding businesses. These organizations can also put you in touch with experienced breeders that can provide the quality breeding pairs needed to get a new business started. The American Federation of Aviculture (AFA) offers two courses in the fundamentals of aviculture. The first level course has nine chapters covering anatomy, behavior, health care, housing, and legal considerations for bird businesses. The second level course has fifteen chapters covering nesting, genetics, incubation, illnesses, hand-feeding, and other advanced topics. The AFA courses qualify for continuing education credits for veterinarians and veterinary technicians. An exotic bird breeder’s salary can vary widely based on the type of birds they breed, the number of breeding pairs they maintain, and their reputation in the industry. As each pair of birds only produces a few eggs per clutch, multiple pairs may be necessary to secure an income that is steady and substantial. Additionally, the larger parrots command significantly higher retail prices than smaller birds. Breeders may choose to sell the offspring of their breeding pairs in a variety of ways. Most either sell their birds directly to individuals as pets or they supply them to resellers such as pet stores. Some exotic bird breeders operate their business as a part-time endeavor, with bird sales profits serving as a supplement to the income that they earn through a full-time position in another industry. According to the 2011-2012 American Pet Product Manufacturers Association (APPMA) pet survey, 5.7 million American households own at least one pet bird. The same APPMA pet survey indicated that 16.2 million birds are kept as pets in the United States. 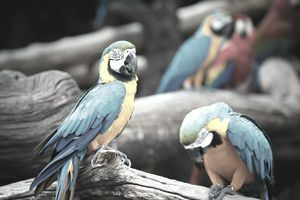 The market for exotic birds is expected to show continued strength as parrots and other birds remain popular pet choices.